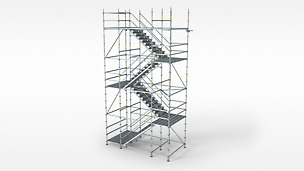 Temporary Access must fulfil different requirements regarding geometries and maximum loads which are defined, in particular, by the respective area of application and user groups. Basically, a distinction is made between access to higher-positioned working areas and temporary access means for public areas. 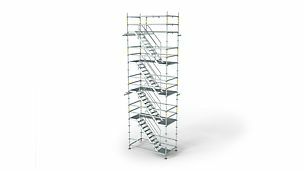 Access solutions for working areas must be adapted primarily to suit the number of users as well as the loads incurred. Authorised users are all those involved in the construction project, i.e. persons in appropriate working clothes with suitable protection equipment. Users of public stairs, however, are all persons who use areas open to the general public – from infants to frail elderly people. In addition, large gatherings of people can be expected. Accordingly, specific requirements for flight widths, execution of intermediate landings and safety equipment – among other things – are to be taken into consideration.